In the last few weeks, it has been all about positivity for ETH and Ethereum as an ecosystem. On one hand we have a fully functional smart contracting platform where token issuers can take advantage of the network’s robust VM and issue smart contracts while on the other, the native token ETH can be used to pay for goods and services. Although asset prices took a hit last year with the technical advisor at Stellar Joseph Rubin claiming ETH prices can spiral down to zero because it can operate within its own environment without fiat and because of the ever-present threat of gas being paid in other tokens other than ETH in an economic abstraction question. Well, from recent events, it is increasingly clear that ETH has hit rock bottoms and after weeks of accumulation, boosting fundamentals as well as the SEC unexpected “guidance” is catalyzing participation as ETH bottom out surging 12.6 percent from last week’s close. Aside Hester Peirce and William, who are part of the SEC, Samsung, the South Korean smart phone and electronic manufacturer has plans of supporting ETH in its secure Blockchain store wallet. If successful and the project gets traction, ETH would be propelled to the mainstream just like what Opera is piloting in the three Nordic countries of Norway, Denmark and Sweden. From opera’s crypto wallet, users can register and buy ETH without having to go through a centralized exchange like it has been the norm. Changing hands at $121, ETH is one of the top performing assets in the top 10. Thanks to Feb 8 price explosion, ETH is up 12.6 percent against the USD in the last week meaning buyers have an upper hand. Even with this, buyers are yet to drive prices above important resistance and first buy trigger line at $135. 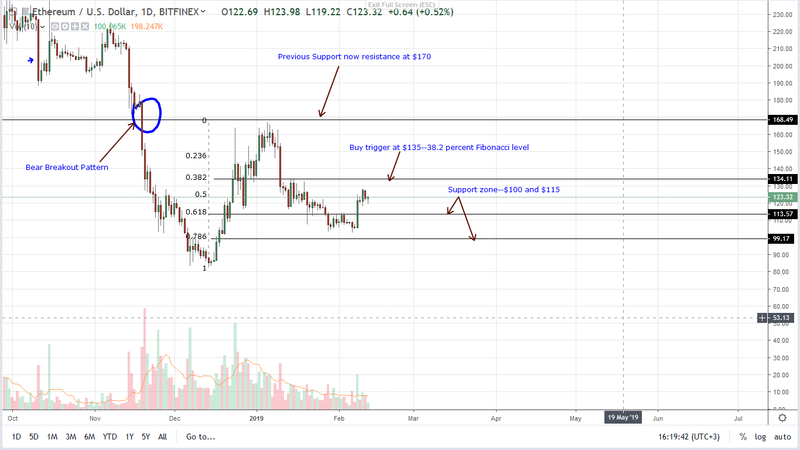 Gains above $135 shall validate our previous ETH/USD trade plans and set in motion the next wave of buy pressure that may see ETH prices retest $170 and even $250. Bulls may be raving right now bit from a top down approach, sellers are technically in control and trading within a bear breakout pattern thanks in part to meltdowns of mid-November. The region between $250 and $300 are important in ETH trading. In the medium term, bulls are clearly in chart. Rejection of lower lows in recent days mean $100 is not only a psychological round number but possible bottoms springing off and marking the 78.6 percent Fibonacci retracement level of Dec 2018. All the same, we expect prices to recover in the short-term and in the second phase of an otherwise bearish trend, chances are ETH will retest Dec 2018 highs of $170 and comprehensive breakouts will propel buyers and ETH to $250 or Nov supports. In a bear breakout pattern, week ending Feb 10 volumes are low, paling in comparison with those of mid-Nov and late Dec. All the same, ETH prices are down 80 percent from peaks and after a prolonged bear market, a recovery is imminent. From the daily chart, our trade plan is simple. For ETH bulls to be in control, then there must be a confirmation of Feb 8 bulls and accompanying volumes must exceed 520k and most importantly recent averages of 203k driving prices above $135 as our ETH/USD trade plan burst to live. Before then, we suggest patience. 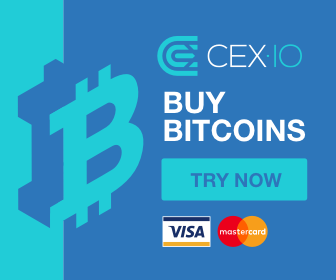 The post After Samsung, Opera Offers an Ethereum Wallet as ETH Prices Add 12.6% appeared first on Ethereum World News.